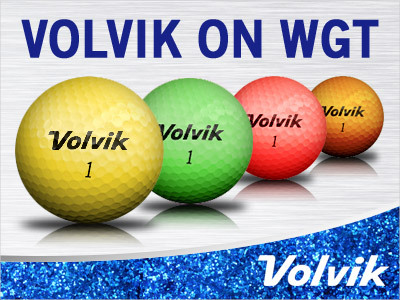 Get the newest virtual golf balls on WGT – Volvik Crystal Balls – available now in bright new colors. Volvik is the #1 color golf ball on tour. Get explosive distance, short game control and a slower WGT swing meter with the new Volvik Crystal virtual golf balls – available in bright new colors: yellow, green, orange, pink and pearl. This week's Country Club of the Week is... The Madrid Golf Club, a Spanish-speaking country club with active members that has grown quickly. The Madrid Golf Club currently has 206 members who have helped the club reach Club Level 8 (approaching Level 9! ), with more than 5.3 million XP (experience points). At Club Level 8, they have unlocked a number of country club benefits, including a free Putter Pal and Shot Pal for all of their members and earning +3% XP per round. Keep playing using CC Passes to level up your club to unlock these benefits too. "We are a Spanish speaking club which has grown very quickly during the past year. This has enabled us to be a little more choosy with our members and support the active type player. Our members participate in our forum with videos, music, jokes and anything else that is the weekly topic. We are very active with weekly tournaments, Country Club Clashes and different tier level matches. We have four very busy team members which I would like to mention for their great participation in our success: Kas64 (Development Director), Tiburn7k7k (Tournment Director), Mafias1982 (Members and Support Director) and myself, johnman1 (CEO). We do have some openings at the moment and would welcome active players of any tier." The current Weekly Leaderboard below shows The Peoples Club at the top (congrats on reaching Club Level 10! ), followed by Sherbrooke Country Club and The old duffers retreat (also congrats on reaching Level 10! ), the Senior Citizens and AUGUSTA NATIONAL CC. Head over to our Twitch page right now - http://www.twitch.tv/wgtgolf - to watch Tour Legend xXxjasonxXx play WGTicon LIVE on Oakmont! WGT will be streaming WGT player matches every week on Tuesdays at 3PM PDT. Note that 3PM PDT is 6PM EDT / 10PM GMT on Tue, and 9AM AEDT on Wed. Learn more about WGT on Twitch, and how to stream your own WGT games on our FAQ. See past Twitch matches here. Come join thousands of other players competing in new multiplayer games right now on WGT Golf Mobile. You'll get automatically matched up with another WGT player from around the world, and compete live on 3 holes, which takes about 10 minutes. If you haven't downloaded it yet, WGT Golf Mobile is free for your iPhone or iPad (we're working on Android). Are you above the cut line? It's not too late to move up the Virtual Tour Season leaderboard to qualify for the December Championship tournament – to compete for the record ONE MILLION credit purse. Be sure to play this month's Trick-or-Treat for UNICEF Challenge tournament and next month's Major tournament – for your last chances to add to your overall leaderboard standing. The top 70 scores in each tier on the overall Season leaderboard will qualify for the December Championship, making history with the largest credit purse ever on WGT. Check your standing now to see your current rank and make sure you stay above the cut line. Post your Round 1 score in the October Trick-or-Treat for UNICEF Challenge tournament by 10/26 to qualify for Round 2, 10/27-10/31. This week's Country Club of the Week is... Morningside Hills, a club built on a strong foundation and focused on improving the club for all its members. Morningside Hills currently has 50 members who have contributed to reaching Club Level 7, with more than 2 million XP (experience points). At Club Level 7, they have unlocked a number of country club benefits, including a free Putter Pal and Shot Pal for all of their members and earning +5% Club XP when members play using a Pass. Keep playing using CC Passes to level up your club to unlock these benefits too. Club owner KevinFleenor describes the beginning of the club and it's evolution to what Morningside Hills is today, including "establishing open communication, getting ideas from all directions (big and small) and taking suggestions/criticism: welcoming them, pondering them and addressing them..."
"Morningside Hills simply started as a small group of guys who wanted to keep track of who was winning more, with the added ability to make our own tournaments. Soon after, we brought in more people with more ideas, added some organization, tweaked things, added things, subtracted things and before long we had a true, strong foundation built - not only in structure, but also in members. Our club runs 'Championship Seasons,' scheduling out a series of tournaments both single and unlimited play...and we've established a nice handful of 'featured' tournaments involving Ryder Cup-style play (our beloved LaBonte Cup), elimination brackets, team total tourneys, all star events and of course some moneyball sprinkled in. The season culminates with a very competitive club championship and even a redemption bracket. Past seasons have seen anywhere from 30 to 50 members." The current Weekly Leaderboard below shows The Peoples Club at #1, followed by Sherbrooke Country Club, The old duffers retreat, the Senior Citizens and AUGUSTA NATIONAL CC. Head over to our Twitch page right now - http://www.twitch.tv/wgtgolf - to watch Tour Legend fmagnets play WGTicon LIVE on Congressional! 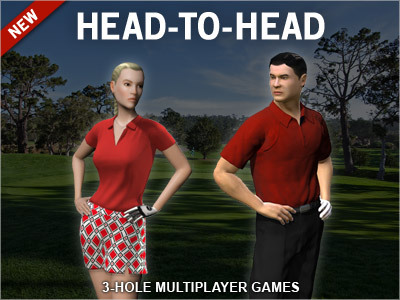 Go head-to-head on your iPhone or iPad in the latest update of WGT Golf Mobile. These new 3-hole multiplayer games are pretty addictive! 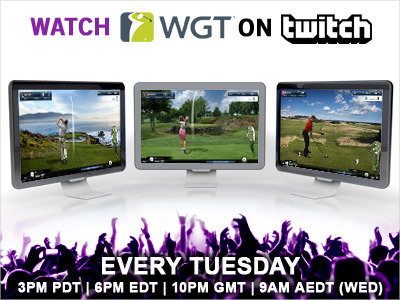 Get matched up automatically with another WGT player in the world, and compete live on 3 holes in about 10 minutes.